Transcription is the exact written reproduction of speech. Meetings, symposiums, conferences, exams, criminal cases, inquests, etc. are usually recorded so they can subsequently be transcribed. The language of the speech and of the transcription is the same, unless a translation or a summary in another language is also requested. Depending on the client’s specifications, “style correction” of the oral speech may also be performed at the time of transcription. 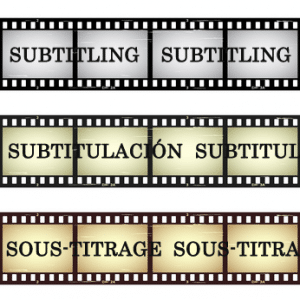 Subtitling consists in inserting texts (often the translation of speech) onto cinema or television pictures, usually on the lower part of the screen, for the purpose of accompanying dialogues or commentaries. In journalism and advertising, subtitles or captions are used to identify or describe situations or products, allowing the recipient to contextualise and understand the information or message aimed at her. In cinema, following subtitles and listening to actors’ or narrators’ speech can be a good aid for learning the language. Acantho offers these services for all languages.